For an architect/urban theorist/planner like myself, Dublin’s transportation system seems to defy logic. I lack the adjectives to describe it. But Eric Jaffe depicted the situation effectively in his October 2012 article in The Atlantic Cities. 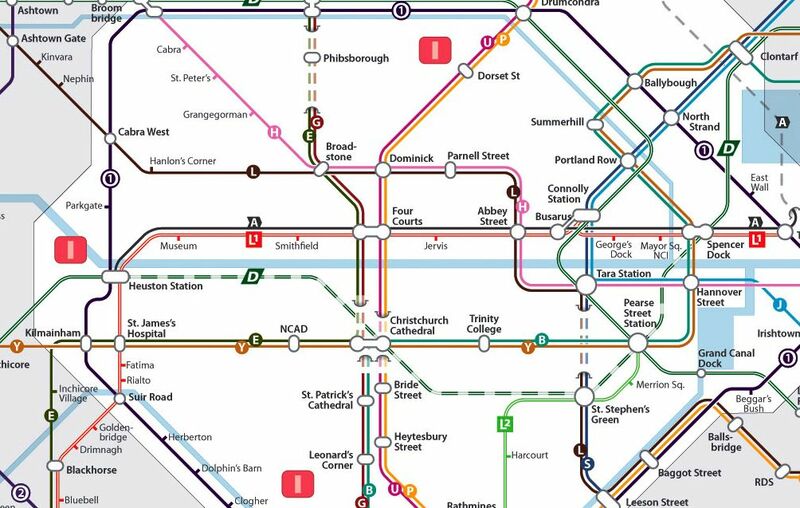 His piece, titled “The ‘Confusing and Nonsensical Grandeur’ of Dublin Transport,” highlighted solutions posed by Aris Venetikidis, a skilled and clairvoyant graphic designer. Apparently when Venetikidis arrived in Dublin, he was as perplexed as my sister and I about the lack of a comprehensive transportation network map. It’s a guide we look to in other cities when we want to travel around. We consider it essential. Venetikidis let this frustration blossom into beauty. Like Colin Broderick, he too created a map of existing routes. And then Venetikidis took this work a step farther. He researched the history of past proposals. And he designed several new maps. They illustrate how various moves could improve transportation by making the network more coherent. Jaffe’s article on the topic is worth a read… I thank Fulbrighter Amanda Burnhard for send it my way! ← Previous Post Looks Like Tom’s been Busy!